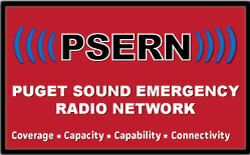 The PSERN Project made significant strides in 2017! The year started off with a bang with construction beginning full steam ahead at several radio sites. A radio site is a site that provides radio coverage for the new system so there is a lot of different type of work that goes on at each site a you will see in some of the pictures below. However the most important work are building and upgrading radio towers. Towers are a must in order for the radio system to exist. It may sound like an easy task, but what happens behind the scenes is much more impactful. Once a potential radio site is identified, the project must acquire a lease in order to build on the property. This means a lot of coordination with property landlords and owners which can take some time. In addition to leases, several permits and licenses must be obtained for construction. Towards the end of the year, the project received several approvals for licensing from the Federal Communications Commission (FCC) which is a huge win. Below is a look at the very first brand new tower that was built in 2017 at the Norway Hill radio site located in Bothell. The project team is looking to complete several more in the new year! Brave crews climb high to work on the new Norway Hill tower. A sunny day for the brand new Norway Hill tower to be complete! A lot of electrical work goes into each radio site. Retaining walls are a must to keep water and earth from seeping into areas that could damage equipment. Shelters at the radio sites are built or upgraded to house the new radio equipment. A huge milestone for the project in 2017 was Backhaul Factory Acceptance Testing (BFAT) that took place this past fall. PSERN team members traveled to Texas to Aviat Networks Inc. to perform several test on new system equipment. New routers for the radio sites. PSERN team members take a moment to pose during their visit to Texas. After months of grinding on a very complex project, the PSERN team took some time in 2017 for team building. There so many different aspects of the project it is important that the team works as a cohesive unit. A tier board is a method that will be used to help the PSERN team stay on track throughout the remainder of the project. The PSERN Mascots made their rounds spreading the word about the project and supporting team members. Firefighter Mic, Sparky the IT Guy and Officer Raquel Squelch.